Deon du Plessis, oldest son of Louis Wicht and Sonny Du Plessis, died at his home in Johannesburg on Sunday 11th Sept 2011 at the age of 59. Few fit the cliché “larger than life” like Deon did. Not only was he a substantial presence physically, but he had the character to match; a character that did not tolerate fools and eschewed politically correctness. Though best known as the founder and proprietor of South Africa’s largest daily newspaper The Sun he will be remembered by friends and family as a great story teller, a generous friend and family man, a keen amateur historian, a man who seemed to embody many contradictions, yet managed nonetheless to gain the respect and admiration of those he supported and even those with whom he vehemently disagreed. Deon embodied the great tradition of maverick newspaper men such as Robert Maxwell, Conrad Black and the fictitious Citizen Kane (immortalised by Orson Wells). Deon had an aura of indestructibility so it was a huge shock to the family when he died suddenly from complications arising from acute bronchitis. He leaves behind his wife Vanessa, his daughter Daniella & her husband Neels, two grandchildren Alexis and Max and his brother Adrian. Seton Bailey, Deon’s cousin, attended the cremation and memorial service. “It was a poignant, dignified though still quite festive gathering which was very well attended by printing industry stalwarts and luminaries and many tributes poured in from far and wide. It was very clear that Deon was loved and respected by many as a journalistic mentor and a pioneer who changed the face of mass newspaper distribution in South Africa with the introduction of the Sun newspaper, opening up a previously un-tapped, massively lucrative, vast tabloid, `blue-collar’ market and dedicated readership. The gathering was a admixture of seemingly very different people from vastly different cultures who all shared an instant where time somehow seemed to stand still - with the winds of change whipping all around, in the eye of a perfect storm if you like - in which so many diverse people from so many cultures each for their own peculiar, hilarious, momentous, insignificant, material, spiritual, genealogical, historical, business or metaphysical reasons momentarily united in a common desire to honor and remember Deon. From praise-singers & sangomas, to editors and former army colleagues, from fellow journalists to foreign correspondents, they all came up to pay peculiar, personal tribute. Attached are just a few selected pictures. Deon was a colossus, literally and figuratively and he is sorely missed by many. When Atlas shrugged the world took notice. We continue to feel the ripples in the media. Thanks so much for the opportunity, it was well worth it. The white hyena, the gun-loving boer, that great newspaper man who gave SA’s blue-collared hordes news worth reading is no more. In his place a giant of a legacy – a tabloid every flailing newspaper’s trying to copy in a sector where the Daily Sun remains unrivalled. Tragically Du Plessis, who died this weekend at the age of 59 in his home in Johannesburg, was about to take three months' sabbatical. "I have never had a holiday like this before... so actually I have no idea what I'll do with it," he told his blog's email subscribers (myself included) last Friday. "I think I should prepare myself for the dreaded bouncing ball... Without even being planned, one thing will follow another. I will probably set about bringing my spoken Portuguese lessons up to speed using one-on-one lessons I have never had time for. Then I will go to Portugal... I mean: why not? "From there I will follow the footsteps and hoofsteps of the Duke of Wellington as he kicked the French out of Portugal in the early 1800s. That, I prophesy, will lead me to the bigger battlefields of the same Peninsular campaign in Spain... Then I will probably go to Cadiz because it sounds romantic and I want to hear the Atlantic crashing on the sea-walls..."
Vrye Weekblad founder and author told Bizcommunity: "I met Deon in Angola in 1978. We were both covering the war. I didn't know who he was and only after he spoke and I thought I recognised his accent did I introduce myself. I told him I thought he was Russian and he found that hilarious, going into a very insightful comparison between the mentalities of Russians and Afrikaner nationalists. "He had a talent always to see beyond the obvious, to notice stuff other journalists never pick up on," says Du Preez. "He was very supportive when I launched Vrye Weekblad in the late 1980s but was clear in his advice. 'Do it quickly and get out, then go and make some money - there's nothing as pathetic as a destitute old hack,' he said. Deon was the most entertaining company one could ever ask for." "This was a man who brought a particular kind of genius to the newspaper world. He had idiosyncratic views and yet a complete understanding of the need to get deep into the things that make his readers sing, laugh and cry. He understood how to reflect these, and how to address their issues. He created a newspaper that sees hundreds of people come to talk in person to the Daily Sun as it is their friend that helps them to manage and take control of their lives. "He was a brave change-maker, believing in a market at a time that not many others did. He was a good friend and colleague and a man who respected and loved his family with a deep passion." A tale often told is that Du Plessis crunched the numbers and came up with the idea of the Daily Sun while at Independent Newspapers. The firm failed to see the value in it so the two took it to Media24. The rest is publishing history. Within five years, the paper that dishes up a skilfully edited daily mix of information and entertainment had become the biggest paper in the country - hitting a high of 500 000 sales before beginning to fall back during the worldwide recession. While the paper's readership as measured by AMPS is more than 4.6 million readers, its ABC circulation was at 381 000 in the second quarter of this year. Du Plessis made a deep impression upon the many people with whom he worked - as a consummate journalist and a party animal. The head of Independent Newspapers in the Western Cape, Chris was a reporter at the Sunday Tribune when Du Plessis was an assistant editor at the paper and worked with him again when Whitfield was the deputy editor of The Sunday Independent and Du Plessis was head of Independent Newspapers Gauteng. "Deon was one of the few people who genuinely deserved being described as larger than life," says Whitfield. "He was not one for small measures: he drove the biggest cars, lived in the biggest house (with the biggest TV screen I had ever seen), hired the biggest bodyguards (we never really worked out why they were required but they were always around in those days), threw the biggest parties and was a big man himself. "He was also one for big ideas, one of which gave rise to the Daily Sun... By contrast he was also thoughtful, caring and could write beautifully. He is a great loss to journalism." The Bloomberg reporter says: "He often acted the buffoon and sometimes did crazy things but he was really a very smart editor who inspired real loyalty among his staff. "He was a very sociable person and would invite the lowliest reporter to his house in Houghton for legendary parties. I left the Pretoria News shortly after he took over in 1993 to backpack through Europe and perhaps find a job in London. Two months into my travels, I unexpectedly received a phone call one morning at the backpackers' hostel I was staying at in London. "It was Deon - how he had tracked me down, I don't know. 'Brand,' he said in his gruff way, 'It's time to come back.'... It was difficult to say no to Deon. As a result, I was involved in covering the story of a lifetime and I will be forever in his debt." Du Plessis was generous with his knowledge, although he did not suffer fools. He was also incredibly humble about his achievements. As then acting director of the Institute for the Advancement of Journalism (IAJ), veteran freelance journalist Raymond Joseph recalls taking a group of young journalists doing a course at the institute last year to the Daily Sun for a show-around. "I expected some underling to handle it, say a few words and then send us on our way," says Joseph. "To my surprise, Deon himself pitched up to talk to them about the paper - and for more than an hour he spoke with genuine passion about the Daily Sun and its target reader, the man in the blue overall, passing on valuable journalism lessons to the youngsters, who hung on his every word. "I had heard him on this subject before but never with such clarity and I, for one, finally truly understood why the paper was such a runaway success. Yet, when I asked a leading question referring to his vision - and his hands-on role in its success - he was quite self-deprecating, playing his part down. "It was left to me, later, to tell them about Deon, a bull of a man and the consummate journalist, an old-fashioned editor who got his hands dirty and was always in the trenches when the real work was being done. Deon worked hard and, when the work was done, he played equally hard. A true character of South African journalism, he will be sorely missed. But his legacy as the father of red tops in this country lives on." It was that vision that turned him into one of the most powerful publishers in the country. 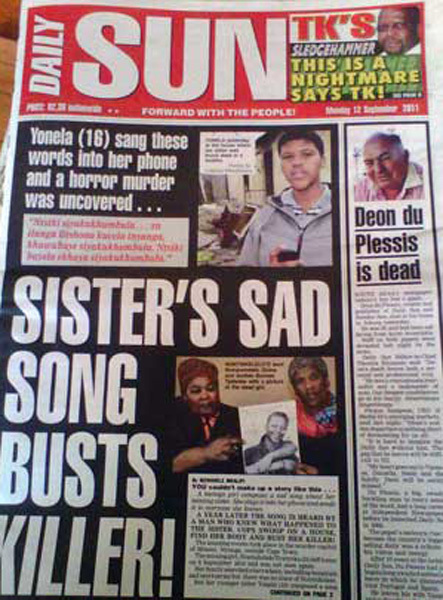 The Daily Sun hit the spot, and brought millions of new readers into the newspaper world. It has over five million readers and those readers, Du Plessis told The Media, are where the country’s power and money base resides. “The fact that political leaders like Helen Zille campaign in townships and not suburbs like Parktown North, proves this point,” he said. My most vivid image of him is when he was at Independent and I was with MWASA – we used to lock horns a lot. One day after WEEKS of wage negotiations, I was giving him stick about maternity leave and he lost it. Got up, walked to the wall, and started banging his head against it, shouting ” I CANNOT take Nicole Johnston ANY more!” True story! The scariest day of my career was when I had to resign from the Pretoria News to take up the editorship of Longevity. He crapped all over me for wanting to go to a ‘magazine for wrinklies’, didn’t speak to me for the month of my notice or the next 10 years, then told me at a Media24 conference when I was editing Fair Lady, the I ‘did good’. An enormous man in so many other ways than the obvious. What a loss to the industry and to his family. A real people-person, that one. I once returned from a long lunch at Kapitan’s (remember that) with a mate: phoned the wrong number and got Deon. He invited my mate and I to come on up: there was a bottle of whisky waiting on his desk and he told us told us to go down to the far end of his office and drink it (quietly, if possible). Deon du Plessis loved to say in his weekly blog posts as the Daily Sun publisher: "This is how we roll it in Sunland" - and this swashbuckling phrase sums the man up, too. He was larger than life, rambunctious and generous - a genius newspaper man with ink in his veins, feared and fearless but, above all, the visionary who started the tabloid newspaper industry in this country when he opened the Daily Sun nine years ago. Kanthan, of the Durban Post says “I first met Deon du Plessis at the Sunday Tribune offices in Field Street during the early 1980s where he was deputy editor. He was a giant of a man – I stand close to 6 feet tall, but he towered over me and was almost twice as broad as I am. By the time I returned to the country in 1994, he was by then editor of the Pretoria News. He was widely expected to become editor of The Star in Johannesburg, but instead became the editor’s boss – as managing director of Independent Newspapers Gauteng. I quit my job in Durban and moved up to Jo’burg. Deon was waiting for me on my first day and showed me to my new office right in front of his. He then took me on walkabout through the massive Star building with its hundreds of employees. He walked me through every single department, and wherever we went, he introduced me to every single employee he came across by name, telling me who that employee was and what he or she did at the company. It was my first astonished insight into just how hands-on he was with everything that went on under his leadership. And thus began what was to be a whirlwind mentorship with the most engaging raconteur I have ever met. I became a regular dinner guest at his Houghton home where he and his wife Vanessa wined and dined guests with genuine warmth that is generally the cultural purview of Indians and Jews. Deon, for all his outward boorish bluster, was astonishingly well-read, particularly on military history and strategy and would constantly draw life lessons from the successes and failures of the past. The rest is history. 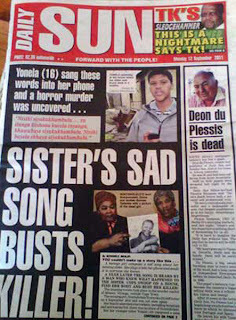 The Daily Sun became the biggest media success story of the 21st century. Amid the “Tokoloshe Ate My Testicles” headlines, the newspaper provided genuine down-to-earth advice on how to get an ID document, how to open a bank account, how to apply for a loan. 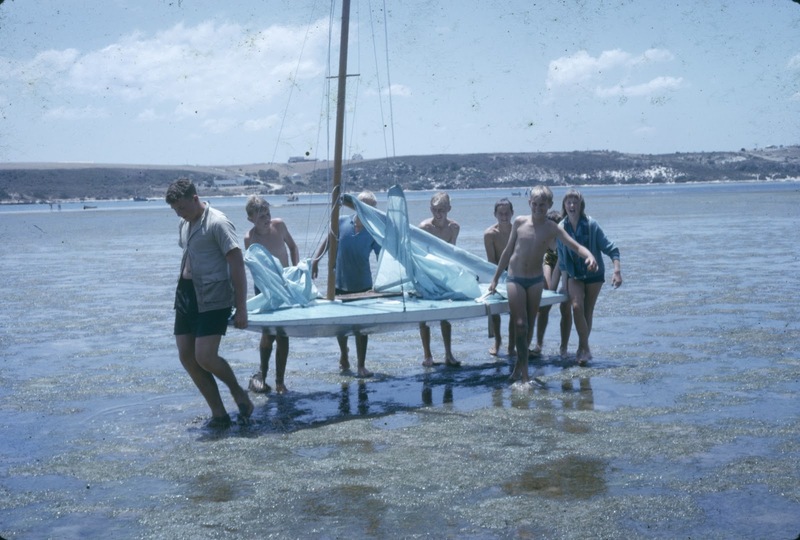 Deon du Plessis is dead. The words do not roll easily off my tongue because it is akin to saying there will be no high tide today. The man who by sheer force of personality built The Daily Sun into the biggest newspaper in the country is no more. There are some who will say that 59 is too young to die, but then as Ridley Scott says, the candle that burns twice as bright burns half as long.